"Les Abstraites" There are 29 jewelry. 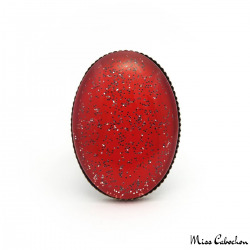 Glitter red oval ring which give shine and brightness to your hand! Curved glass cabochon. Adjustable ring and adjustable to all fingers. Each copy may be slightly different from the picture. Free shipping! 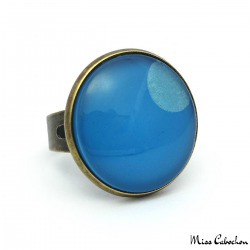 Blue fancy ring: Curved glass cabochon. Adjustable ring and adjustable to all fingers. Each copy may be slightly different from the picture. Free shipping! 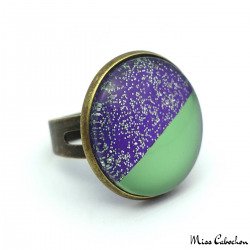 Flashy ring - Pale green and glitter purple: Curved glass cabochon. Adjustable ring and adjustable to all fingers. Each copy may be slightly different from the picture. Free shipping! Oval fashion ring - Purple Moon on Blue: Curved glass cabochon. Adjustable ring and adjustable to all fingers. Each copy may be slightly different from the picture. Free shipping! 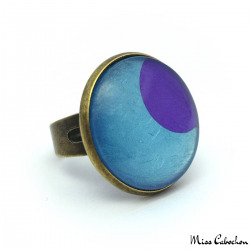 Fashion ring - Purple Moon on Blue: Curved glass cabochon. Bright silver glitters. Adjustable ring and adjustable to all fingers. Each copy may be slightly different from the picture. Free shipping! Green camaieu ring: Curved glass cabochon. Adjustable ring and adjustable to all fingers. Each copy may be slightly different from the picture. Free shipping! 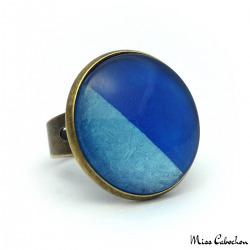 Blue camaieu ring: Curved glass cabochon. Adjustable ring and adjustable to all fingers. Each copy may be slightly different from the picture. Free shipping! Oval fashion ring - Pink Moon on Yellow: Curved glass cabochon. Adjustable ring and adjustable to all fingers. Each copy may be slightly different from the picture. Free shipping! 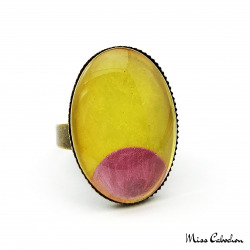 Fashion ring - Pink Moon on Yellow: Curved glass cabochon. Bright silver glitters. Adjustable ring and adjustable to all fingers. Each copy may be slightly different from the picture. Free shipping! Flashy ring - Yellow and glitter green: Curved glass cabochon. Adjustable ring and adjustable to all fingers. Each copy may be slightly different from the picture. Free shipping! 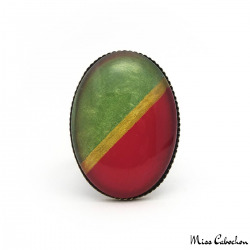 Two-tone oval ring with golden border: Curved glass cabochon. Adjustable ring and adjustable to all fingers. Each copy may be slightly different from the picture. Free shipping! 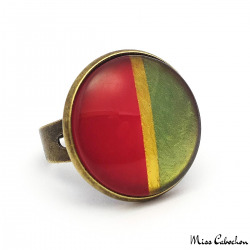 Two-tone ring with golden border: Curved glass cabochon. Adjustable ring and adjustable to all fingers. Ring made by hand using different layers of varnish Each copy may be slightly different from the picture. Free shipping! 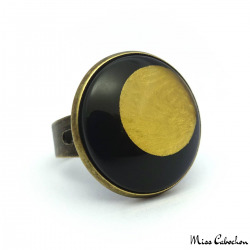 Black and Gold ring: Curved glass cabochon. Adjustable ring and adjustable to all fingers. Each copy may be slightly different from the picture. Free shipping! 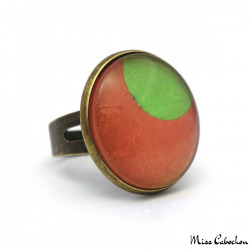 Trendy Oval ring - Green and Orange: Curved glass cabochon. Adjustable ring and adjustable to all fingers. Each copy may be slightly different from the picture. Free shipping! 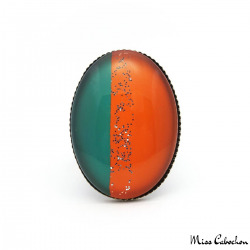 Trendy ring - Green and Orange: Curved glass cabochon. Adjustable ring and adjustable to all fingers. Each copy may be slightly different from the picture. Free shipping! 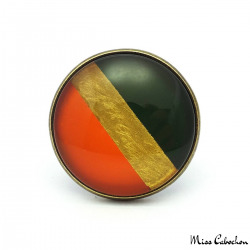 Tri Color Ring - Orange, Gold and Black Olive Green: Curved glass cabochon. Adjustable ring and adjustable to all fingers. Jewel made in a single copy! Free shipping! 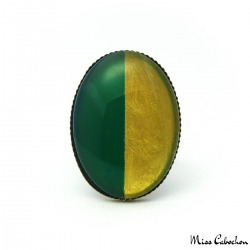 Oval two-tone ring - Green and Golden: Curved glass cabochon. Adjustable ring and adjustable to all fingers. Each copy may be slightly different from the picture. Free shipping! 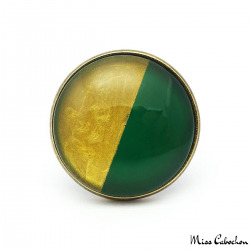 Two-tone ring - Green and Golden: Curved glass cabochon. Adjustable ring and adjustable to all fingers. Each copy may be slightly different from the picture. Free shipping! Oval fashion ring - Blue Moon on Purple: Curved glass cabochon. Adjustable ring and adjustable to all fingers. Each copy may be slightly different from the picture. Free shipping! 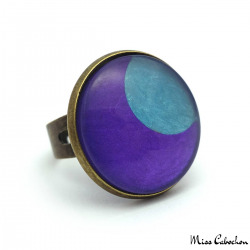 Fashion ring - Blue Moon on Purple: Curved glass cabochon. Bright silver glitters. Adjustable ring and adjustable to all fingers. Each copy may be slightly different from the picture. Free shipping! 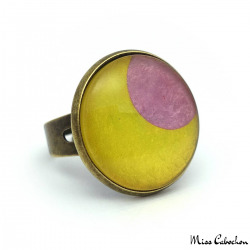 Oval fashion ring - Golden Moon on Pink: Curved glass cabochon. Adjustable ring and adjustable to all fingers. Each copy may be slightly different from the picture. Free shipping! Oval fashion ring - Green Moon on Orange: Curved glass cabochon. Adjustable ring and adjustable to all fingers. Each copy may be slightly different from the picture. Free shipping! 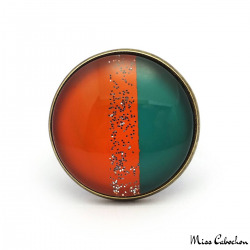 Fashion ring - Green Moon on Orange: Curved glass cabochon. Adjustable ring and adjustable to all fingers. Each copy may be slightly different from the picture. Free shipping! Oval fashion ring - Pink Moon on Green: Curved glass cabochon. Adjustable ring and adjustable to all fingers. Each copy may be slightly different from the picture. Free shipping!